We left Iron Man being used as a hostage for the fake War Machine to keep Warbird away from him, but Tony revives and Iron Man races back to the mansion to get the negator pack. However, it doesn’t work, meaning this armor doesn’t use any Stark tech. 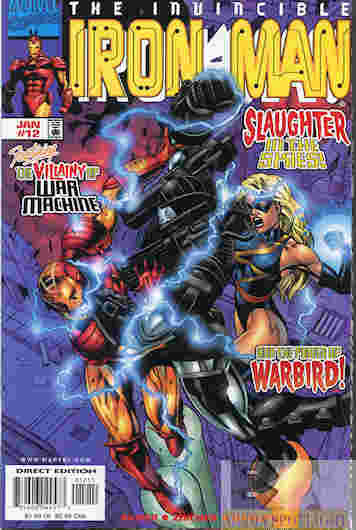 The fake War Machine is able to escape, destroying the Astrodyne building, and later Sunset calls a recovering Tony to offer to fill the hole in his schedule since the proceeds for Stark Solutions go to the Maria Stark Foundation. Convinced Sunset sent Fake Machine out he tries to get into his armor but collapses. Jane and Hank Pym later give Tony the bad news, His armor’s own energy fields is interfering with his healing process, meaning he may not be able to be Iron Man anymore. Tony and Carol reconcile, and Carol assures him she is trying to deal with her alcoholism. To get away, Jane sends Tony to a rehabilitation facility, unaware that it’s been taken over by The Controller! What they got right: Some really good action in this one, plus some good character moments. The danger posed by Tony’s armor gives him a new challenge to overcome. And Tony does love a good challenge. I also like seeing him and Warbird come together. I don’t see a romance there but they could end up good friends. (Until Civil War II but let’s stick to happier times.) Plus the tease for next issue’s story is good. What they got wrong: Because it was in the wrong spot, I started reading an Avengers story that crosses over with the Thunderbolts. In that story Firestar’s powers are killing her because she isn’t properly venting the microwaves from her heat powers or something like that. Busiek’s kind of repeating himself here, unless that happened under a different writer before he took over that comic. Also, a woman trying to get publicity photos of Tony for a donation he made talks about being a fan of Happy’s boxing days and asking him to speak to some kids. Given what happened with Spymaster’s agent (and I’m assuming Busiek isn’t going back to that well) he’d be foolish not to suspect something. Recommendation: Another great issue. Give it a look. Posted by ShadowWing Tronix on July 17, 2018 in Marvel Spotlight, Yesterday's Comics and tagged Carol Danvers, Hank Pym, Happy Hogan, Iron Man, Jane Foster, Marvel Comics, Marvel Universe, The Controller, Tony Stark, War Machine, Warbird.